Volunteers Sam Dillard, left, and his brother Henry of Oldwick, NJ. It’s extremely important to keep wheelchairs clean, and with that in mind, Matheny held its first ever Wheelchair Wash recently. Thirty-five wheelchairs used by Matheny students were cleaned by staff members with the help of volunteers from the community. Volunteer Kim Collichio of Mountainside, NJ. 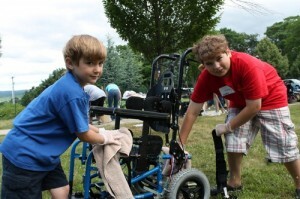 Based on its success, another Wheelchair Wash is being planned for those used by adult patients. This entry was posted in Uncategorized and tagged Kim Siara, wheelchairs, Whelchair Wash. Bookmark the permalink. I am Richard Kelly’s mom….I haven’t been able to visit due to the long distance. If you are in the Green Zone, please visit him..he has been on bedrest and is probably bored!